The Alpha-Stim® AID is a drug-free Cranial Electrotherapy Stimulation (CES) medical device that uses low-level electrical current to safely and effectively treat anxiety, depression, and insomnia. CES was cleared by the FDA in 1992 as a prescriptive, noninvasive treatment. It has an extensive safety record, with few side effects (seen in less than 1% of users and considerable scientific evidence of the significant results patients can achieve. The Alpha-Stim uses small earclips that provide Cranial Electrotherapy Stimulation (CES) to treat anxiety, insomnia, and depression. 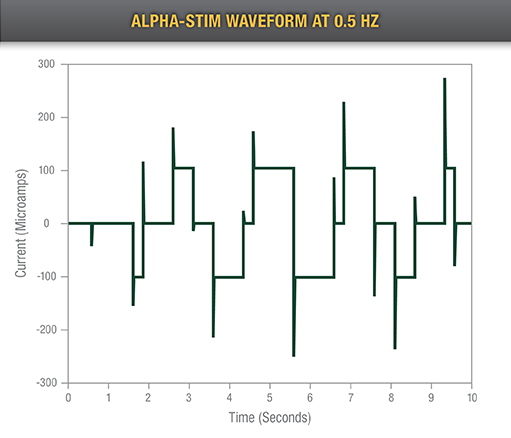 Using a patented waveform, Alpha-Stim is proven safe and effective by more than 100 studies over the past 37 years. As the leader in CES therapy, Alpha-Stim has helped clinicians around the world provide fast, safe, and effective relief from anxiety, depression, and insomnia. qEEG changes in 30 subjects treated with 20 minutes of Alpha Stim CES. There is an increase (Red) in alpha activity with a simultaneous decrease (Blue) in beta and delta2. We offer free trials to practitioners for in-office use. Typically, an in-office or clinic trial can identify those individuals who readily respond to Alpha-Stim treatment. 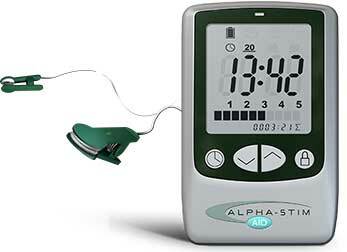 You or your patients can order from our online store or through your local authorized Alpha-Stim representative. Heffernan M. Comparative effects of microcurrent stimulation on EEG spectrum and correlation dimension. Integrative Physiological and Behavioral Science. 1996; 31(3):202-209.